An introduction to Evergreen and its features. Holds can be placed on items in the catalog that are owned by Merrimack or any other NOBLE library. Some items, such as DVDs, newly acquired items, and reference items, cannot be placed on hold. The system will indicate whether a hold was successfully placed on an item or not. 1. Search for the item you are looking for using the catalog. 2. 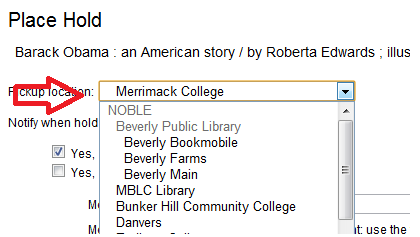 You can just search Merrimack's holdings or expand the search to any library in NOBLE or even all NOBLE libraries. 3. Once you find the item you want, you can click 'Place Hold' from the search results or click on the title and then click place hold. 4. 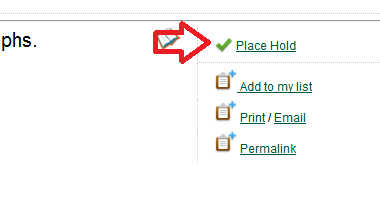 After clicking 'Place Hold' you will need to log in to your account. 5. On the next screen, you can designate a pickup location. 6. You can also decide whether you want to be contacted via email or text when your hold arrives. 7. If you want to contacted via text, you must first select your wireless carrier. 8. Once you have selected your carrier, input your phone number as directed. 9. When you are done, click submit. 10. You will see a confirmation screen after submitting the hold request. Explains how searching using Evergreen is different than searching using our previous system. Explains how passwords work on Evergreen. Details how to place a hold on an item using Evergreen. Details how patrons can suspend, activate, and cancel holds using Evergreen. Explains how to use Evergreen to make and share lists of items. Contact a staff member for assistance. Browse or search for items on course reserve.